Activision reveals the next entry in the Guitar Hero franchise, Warriors of Rock, featuring more than 90 tracks, a Gene Simmons-powered quest mode, and new challenges for every track in the Guitar Hero catalog. Check out the first 35 tracks! The biggest change coming to the Guitar Hero franchise in Warriors of Rock is the story-driven quest mode, featuring Gene Simmons of Kiss and giant-tongue fame, taking players on a journey from the famous CBGBs club to the molten lava fields of rock treachery. Eight Guitar Hero characters transform into Warriors of Rock in order to help the demi-god of rock take down The Beast. It almost sounds a bit like Brutal Legend. Plus, we get to see Gene Simmons hamming it up as the demi-god himself! "The world is a boring place. Come with me, and enter a world populated of Demi-Gods and Beasts. Transform from an everyday person and become the savior of rock and roll," said Gene Simmons of KISS. "It was an honour and privilege to narrate Guitar Hero: Warriors of Rock, even more so, to voice the Demi God. From the God of Thunder to the Demi-God, how cool is that..."
Of course, we already knew about this. We've even seen a brief trailer. Still, official confirmation is nice. What didn't we know? The game will boast the biggest on-disc track listing of any rhythm game, just like every new Guitar Hero release does, including a track written and recorded by Dave Mustaine of Megadeth especially for the game's quest mode. There's even a new guitar controller in the works, inspired by the game's new art style. On top of all that, the game also adds new challenges to every song in the Guitar Hero library, breathing new life into tired old music. • AFI – "Dancing Through Sunday"
• Avenged Sevenfold – "Bat Country"
• Black Sabbath – "Children Of The Grave"
• Buzzcocks – "What Do I Get?" • Children Of Bodom – "If You Want Peace... Prepare For War"
• The Cure – "Fascination Street"
• Def Leppard – "Pour Some Sugar On Me (Live)"
• Dire Straits – "Money For Nothing"
• DragonForce – "Fury of the Storm"
• Drowning Pool – "Bodies"
• Fall Out Boy – "Dance, Dance"
• Foo Fighters – "No Way Back"
• Foreigner – "Feels Like The First Time"
• The Hives – "Tick Tick Boom"
• Jane's Addiction – "Been Caught Stealing"
• Jethro Tull – "Aqualung"
• KISS – "Love Gun"
• Linkin Park – "Bleed It Out"
• Megadeth – "Sudden Death"
• Metallica & Ozzy Osbourne – "Paranoid (Live)"
• My Chemical Romance – "I'm Not Okay (I Promise)"
• Night Ranger – " (You Can Still) Rock In America"
• Nine Inch Nails – "Wish"
• The Offspring – "Self Esteem"
• Queen – "Bohemian Rhapsody"
• Rammstein – "Waidmanns Heil"
• The Rolling Stones – "Stray Cat Blues"
• Silversun Pickups – "There's No Secrets This Year"
• Slayer – "Chemical Warfare"
• Stone Temple Pilots – "Interstate Love Song"
• ZZ Top – "Sharp Dressed Man (Live)"
Hooray for less unknown music and more good old rock! 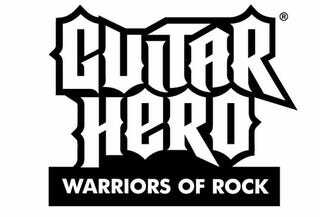 Guitar Hero: Warriors of Rock is being developed by Neversoft for the Xbox 360 and PlayStation 3, with Vicarious Visions handling the Wii version. Look for it this fall.